Bhagavan Sri Skanda is known as Murugan and by numerous other names in different parts of India and Ceylon. His story dates back centuries before Christ. The scene of Skanda's birth is set in the Himalayas. His birth and life are written in the Skanda Purana, an epic poem which dates from the fifth century A.D. In India, countless shrines are dedicated to Him, but there are six major ones, each with a separate name. These six as a whole are known by the title, "Aarupaddai Veedu." In Ceylon, in the heart of a forest with roaming elephants, leopards and other beasts, is the Sri Skanda shrine of Katragama, famed for its many healings and miracles. The fire-walking ceremony is one of the many unexplained phenomena that regularly occur there. The many forms of Skanda are worshiped in numerous ways. The priests worship Him in elaborate rites and ceremonies. The aboriginal Vedda invokes Him with dances in the primitive manner of the woods. The philosopher meditates on Him in silence as the Supreme All-Pervading Spirit of the Universe, the Essence from which all is manifest. "Know me as Skanda, the Warrior Chief." "Subramanyam [Skanda], Son of Siva, is the personification of the highest possible state to which the law of evolution leads. His name means 'He who tends the spiritual growth of aspirants.' Knowing Him in all His aspects amounts to knowing the spiritual possibilities latent in man. 'Through the Son, the Father is known.'" Skanda is known to have arrived in Ceylon in the remote age when it belonged to Lemuria, a vast continent that stretched from Madagascar to near Australia and included India as well as Ceylon. This territory was once ruled by a titan who became the terror of the Celestials who had taken form to live upon the Earth at that period. In answer to their prayers, the God Skanda was incarnated as Son of the Supreme God Siva. He led a mighty host to Ceylon. It is said that the sky and earth were confounded, the earth shaken at its foundation, such was the mighty uproar of this battle among the Gods. Skanda destroyed the titan with His vel, or lance, a symbol which typifies Skanda's energy of wisdom. Once the titan was finally defeated, he was granted forgiveness by Skanda for his sins and was changed into a peacock, upon which Skanda now rides; therefore, the peacock, one of whose many names is Myol, has great significance in the lore of Skanda. When Skanda wishes to make Himself known, one might see a colorful peacock feather appear or even see a vision of a peacock with tail raised. In this, Skanda symbolizes the highest quality of the Godhead which conquers the qualities of the lower nature. Riding upon the transformed titan represents turning the lower energies of God's creation into higher uses. Skanda is said to have issued from the third eye of Siva as six sparks of fire which were cast into the Ganges. They then flowed into the holy Himalayan lake Saravana and were transformed into six babies. These were taken care of by the six nymphs of the constellation of Pleiades, and the six aspects or powers became unified into one in the fond embrace of the Goddess Uma and took the present form called Skanda. "There were giants in the Earth in those days, and also after that when the sons of God came in unto the daughters of men,"
noting that there were two races: one highly evolved set of beings and those from a lower state. The sparks represent fire or the life energy which proceeds from the Supreme Spirit Siva, a symbol of Divine Energy. In spiritual terms, six is a symbol of accomplishment, that which serves to usher in the seventh, which is perfection. The water upon which the six sparks fell is a symbol of Truth or Eternal Reality and the source of all manifestation. In Genesis, God created water from which, in the beginning, all manifested. 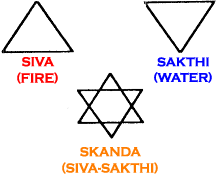 Master Hilarion calls the six sparks the Skandas and says they create the life energy in each chakra. When the Mother of the Universe, Uma, embraced the six sparks or babes, they became one. This represents evolution's ultimate goal. Therefore, the Celestial God Skanda has come to Earth as the epitome of the Divine which unites as one in the seventh chakra, the place of liberation. The Sakthi force, always striving to master the lower nature of humankind, then yields itself to the service of mankind, and the lower natures are overcome. Skanda is the symbol of the divine purity of yoga, a word whose root means "yoking oneself to the Father/Mother God." As time went on and Lemuria sank into the waters, the Celestials returned to their heavenly abode and ceased to walk among humans. Skanda has come close to the Earth plane in his ethereal form to lead us back once more to our heavenly state by raising the six sparks of kundalini power upward, readying us for the Age of God about to come. All the higher planes of the "many mansions" are working together for this purpose. None are in conflict with the other, whether it be other Planetary Beings or Jesus, Krishna, Buddha, Skanda or the other Celestial Beings. All are concerned and working in unity, wisdom and love to save Mother Earth.